A month after its launch, NB Online looks into what’s different about the newest iPhone and whether its features are a help or hindrance to users with sight loss. The iPhone X, Apple’s latest flagship phone was released last month to the usual fanfare and queues of tech enthusiasts. 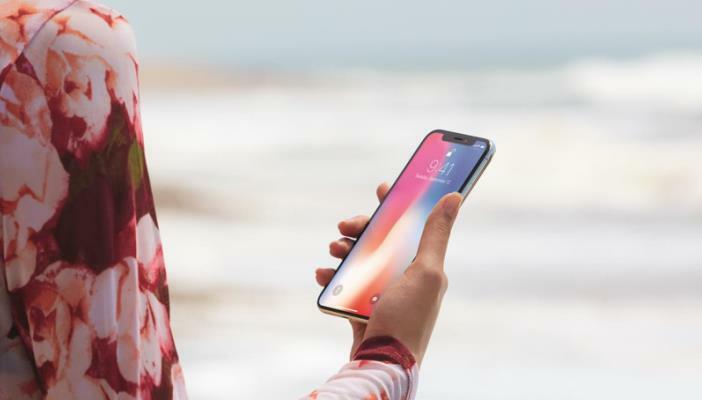 NB Online’s Dale Milligan spoke with Mohammed Atif, Technology for Life Advisor at RNIB and iPhone X owner, to find out what he thought about the new model, both professionally and personally. “Overall I think it’s brilliant. It’s robust and heavier than previous models and does have a real premium feel,” Mohammed said. The real difference between the iPhone X and other models, and their most unique selling point so far, is the introduction of Face ID. Face ID is a secure method of authentication which ensures the device can only be unlocked by the owner. The process is enabled by the state-of-the-art TrueDepth camera system and technology that accurately maps the geometry of a user’s face. As well as unlocking the phone, which previously has been controlled by a number passcode or unique thumbprint, users can also authorise purchases app stores and make payments with Apple Pay. According to Apple it is designed to work even when users are wearing hats, scarves, glasses, contact lenses or sunglasses. It’s also designed to work both indoors and outdoors or even in total darkness. “The problem with this feature for some blind or partially sighted users is that it is attention-aware. This means that if you don’t, or can’t, look at the camera for long enough it won’t authenticate." Mohammed explained. “Essentially, all you have to do is look at the phone, which for many, has raised some serious practical and security concerns. For example, if somebody was to take your phone, they could unlock it without you noticing by pointing the camera at your face. As the Face ID also replaces Touch ID to authenticate payments, theoretically you could accidentally make a purchase simply by looking at your phone at the wrong time. “If you can’t use the attention-aware version of Face ID, then I would recommend you just stick to authenticating with a password. Admittedly it’s a slower method, but since Touch ID is no longer an option, it’s definitely the safest way to use your phone,” said Mohammed. The new screen is edge to edge (top to bottom and side to side) which means the home button has been removed. While having a bigger screen size and high-quality picture means watching films and using the magnifier might be improved, many blind users who regard the the home button as a ‘swiss army knife’ might feel lost without it. “One of the things people have been worried about is the lack of a home button,” Mohammed explained. “As the front of the phone is now essentially a complete slab of glass, there’s no physical indication of what’s what. The main concern is that without the home button there’s no option to unlock the phone through Touch ID as before. In a smartphone, the processor is the "brain" of the device. The bigger the processor, the faster the apps will run. “The new specification for the processor is very powerful, it’s basically a desktop computer." Mohammed said. "The device’s memory and processing power will help it make the most of augmented reality apps and high definition video and audio files. The new camera is very clear and will help object recognition apps like Microsoft’s new Seeing AI." What do others say about iPhone X? “Apple is one of the few companies that do all they can to make the latest tech available to all, with the exception of the price tag.” Tim Dixon. “With more people that I know getting reduced PIP, who really can afford to spend that amount of money? Certainly not me.” Everhald Hyme Purdy. “I am intrigued as to the possibilities that the new camera offers, especially the tech used to perform Face ID. Could this be used to measure depth in other ways that could be useful to someone who is blind?” Jim Benstead. It’s tough to talk about the iPhone X without mentioning it’s price tag. Starting at £999 it’s the most expensive model so far. Mohammed said: “The cost is a bit on the high side. One thing to keep in mind is that lots of service providers charge over the odds with their contracts. For those keen to upgrade to the iPhone X, it might be worth looking for a SIM only contract. Alternatively there’s the option of Apple finance plans or the Apple Upgrade Programme.